Today I did something unusual. 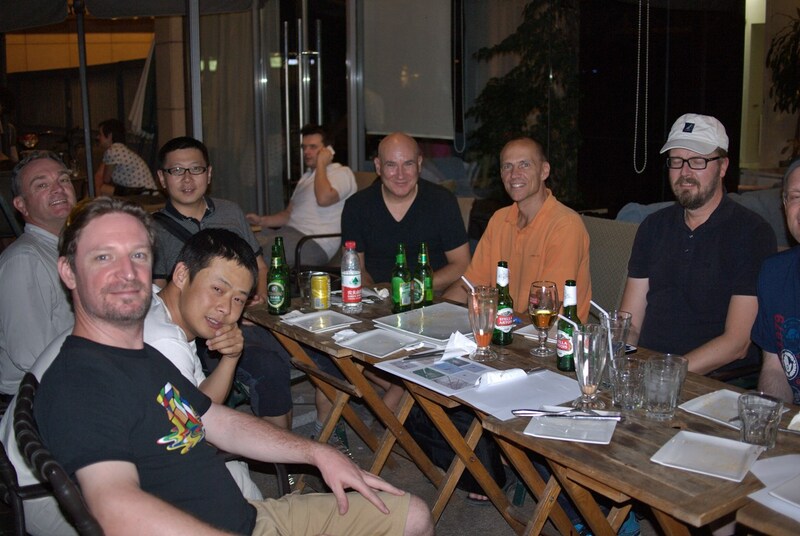 I ‘twitched’ a bird in Beijing. 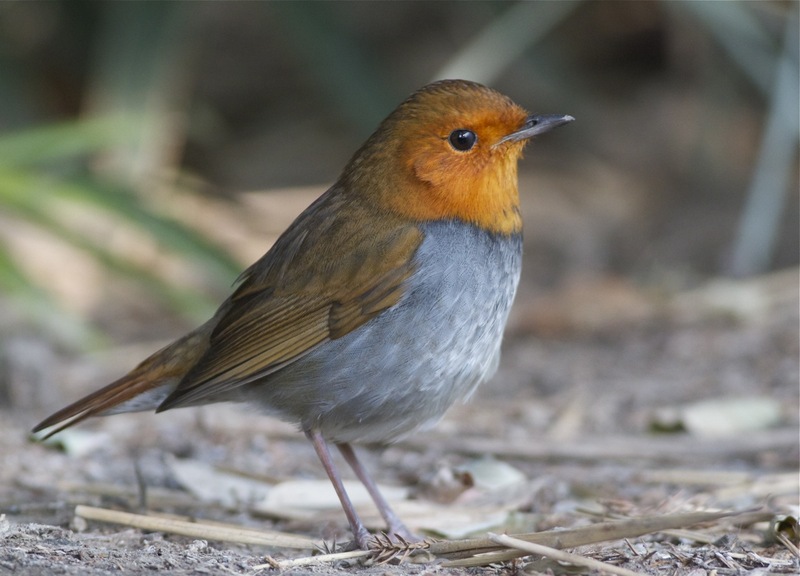 But it wasn’t just any bird; it was a JAPANESE ROBIN (Larvivora akahige). A friend sent me a message yesterday afternoon to say that one had been discovered in a small park close to Beijing West Railway Station and near the 3rd Ring Road. It seemed an unlikely spot for what, I believe, is only the second record of this species from Beijing Municipality. That’s the beauty of birding – just about anything can turn up anytime and anywhere. I arranged to meet new Beijing resident birder and friend, Jennifer Leung, at 0645 for the short journey to the site, where we met with Zhu Lei and a few of his birding companions. 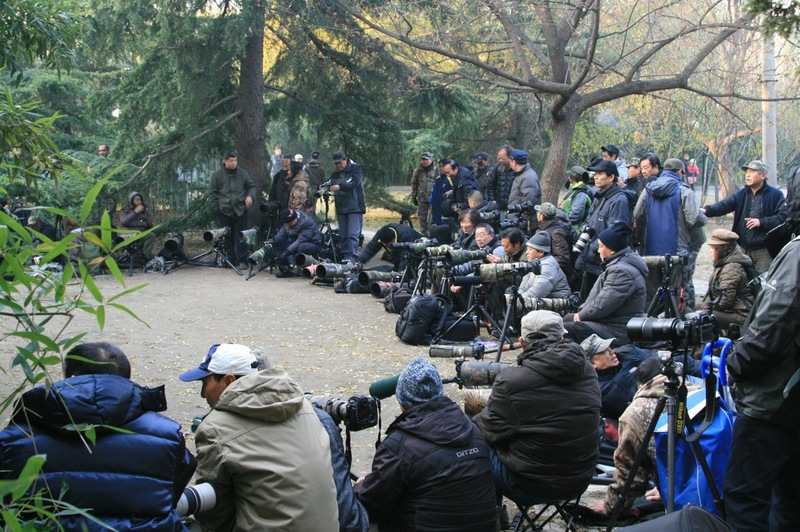 I knew that this bird would be popular with bird photographers, a growing band of which is active in Beijing. I didn’t quite expect the crowd that greeted us on arrival. There were at least 30 photographers already lined up in a semi-circle around the robin’s favoured stand of bamboo. 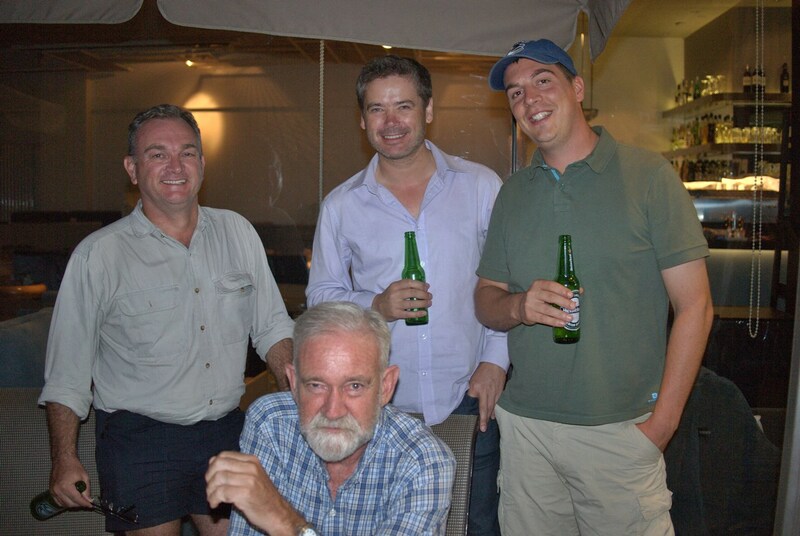 It was very sociable and people were chatting and drinking tea while waiting for the bird to appear. They didn’t have to wait very long. Someone spotted the Japanese Robin as it headed towards the open ground. Silence suddenly descended on the crowd as everyone focused their lenses on a small stone, around which some meal worms had been placed. Out popped the Japanese Robin and there was a brief volley of camera shutters, as if Brad Pitt and Angelina Jolie had just arrived at the Oscars, before the bird darted back into cover. I concentrated on watching the bird during this first brief appearance. In size and behaviour it reminded me very much of the European Robin I am so used to from home. But somehow it was more exotic, with wonderful contrast between the bright orange throat and black-speckled grey breast. A really beautiful bird. The robin continued to make regular forays from its favoured patch of bamboo, much to the delight of the photographers and, as the sun moved higher in the sky, the light improved, enabling some good images to be captured, even with my relatively small 400m lens! Japanese Robin, Beijing, 24 November 2012. A stunning, and most unexpected, bird. 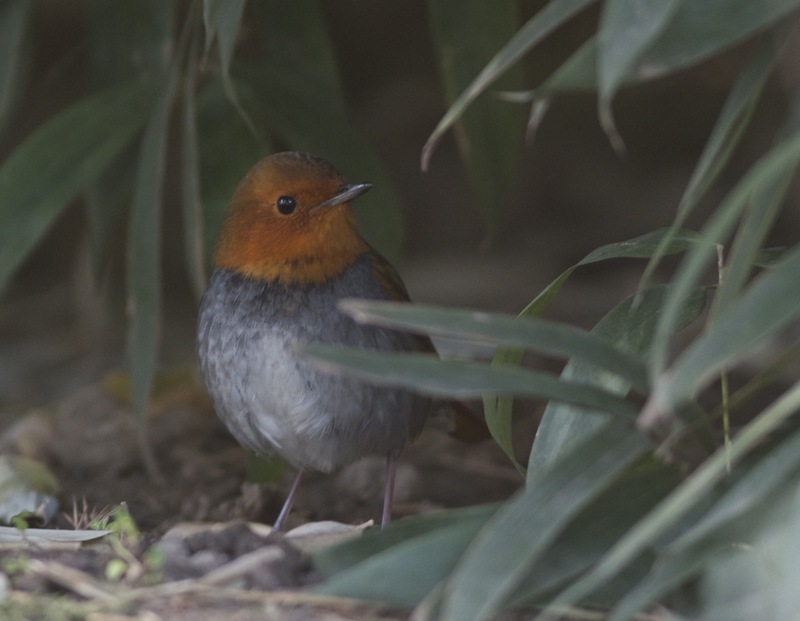 A little later I was fortunate when I found the robin foraging along a different part of the bamboo and, as I sat motionless, it hopped to within a metre of me. 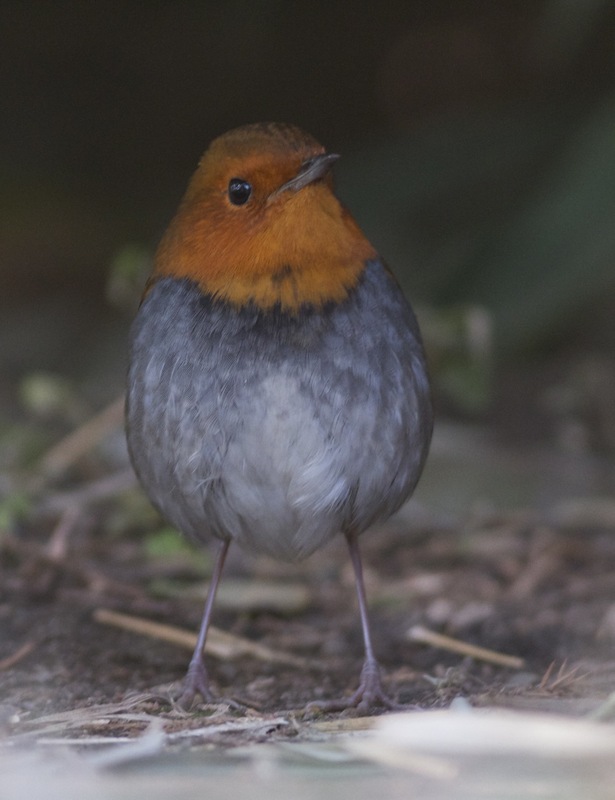 I just watched in awe as the robin held its head to one side, as if to weigh up what I was, before carrying on along the edge of the bamboo… wow.. what an encounter. It appeared to have a bad eye – on occasions it would close its left eye for several seconds at a time before slowly reopening it. In all other respects it looked healthy and seemed to be moving and feeding ok.. Hopefully it’s not a serious problem. Japanese Robin, Beijing, 24 November 2012. Although generally preferring the shade of the bamboo, occasionally it emerged into the open and posed for the cameras. 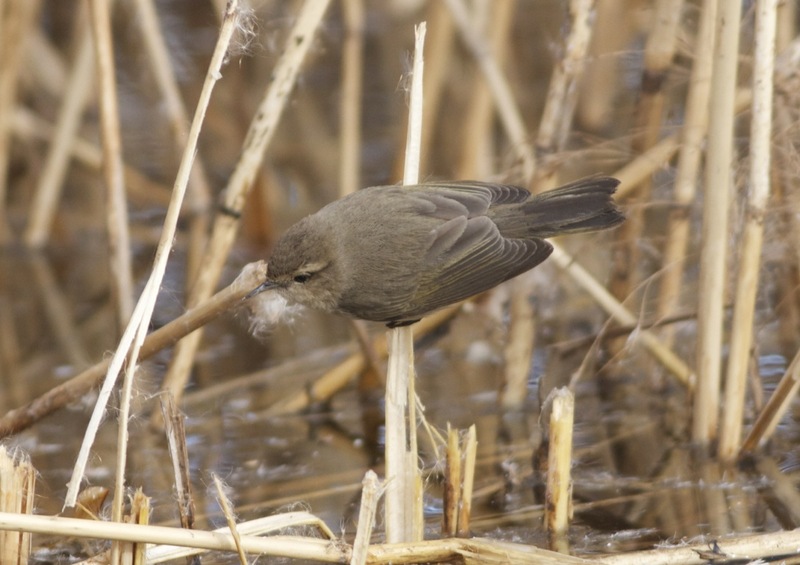 As far as I know there is only one previous record of Japanese Robin in Beijing. That bird, like this one, appeared in the second half of November. It was photographed in the Botanical Gardens. Many people thought it was probably an escape. 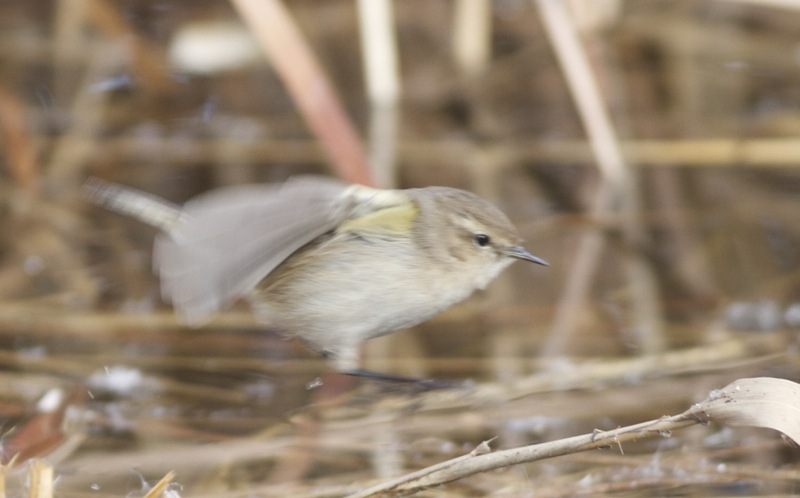 However, with this year’s bird appearing around the same time of year, together with another bird in Shanghai in recent days, it seems likely that this bird is wild. I spoke today with a local birder who told me he had, over a ten year period, seen over 300 species of bird in Beijing’s Bird Market (astonishing in itself) but that he had never seen this species there. 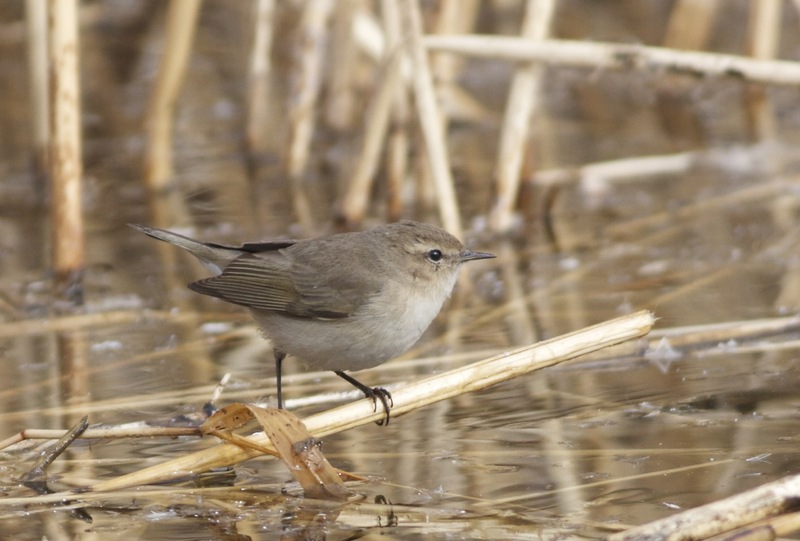 Whatever its origins, it is a stunning bird and one well worth spending a few hours observing today. Thanks to Jennifer Leung, Zhu Lei and his friends for their fun company today.